When Iceland announced it was seeking a $6bn (£4bn) loan from Russia to help rescue its crisis-ravaged economy, some in the NATO alliance, of which Iceland is a member, took fright. They suspected that Russia was acting to further its geopolitical interests in the region in the guise of a white knight. Reports of Russia seeking - or even securing - rights to Icelandic fisheries, energy and metal sectors, as well as in tourism, poured fuel on these fears. Russia has denied any political interest in its dealing with crisis-hit Iceland, but even some Russian media outlets have expressed scepticism, publishing caustic headlines such as "Ready to buy Iceland for good money". "If Russia becomes the country which saves the Icelandic economy, Russia could also end up securing an extended level of power in the North Atlantic," BarentsObserver website said in an editorial. Iceland took particular offence at Britain's use of anti-terrorism legislation to freeze assets of banks operating in the UK. As Gauti Kristmannsson, an associate professor of translation studies at the University of Iceland, put it, "We thought we had friends, in Europe and in the United States." "The disappointment with our old 'friends' is great," he wrote in the New York Times. Russia's deputy finance minister Dmitry Pankin said that Iceland had first asked for a 4bn-euro loan in August, before the island's financial troubles became fully known. He said Russia saw it as a good investment opportunity. Many observers in Russia suggest Moscow decided to try and save Reykjavik to improve its international image. As Itogi magazine put it, "Most Russian analysts tend to think the offer of credit is nothing other than a branding move, set to demonstrate that despite the financial crisis, Russia will be able both to master it and to grant credits to Western countries if they ask for help." 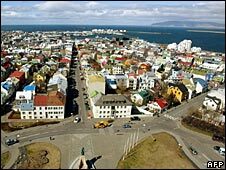 Some press reports also suggested that some of Russia's oligarchs failed to withdraw their money from Iceland's troubled banks and they had pressured Moscow to help Reykjavik. 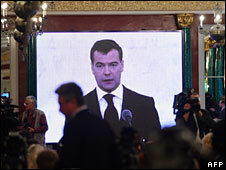 But no loan was agreed and, as the global financial crisis intensified, Moscow's focus turned elsewhere. "Russia has its own financial difficulties at the moment, its own crisis to fight," says Jon Danielsson, an Icelandic economist at the London School of Economics. Other analysts suggest that the Icelandic government never seriously considered taking money from Russia - it was simply a strategy to secure help from Western Europe and the US. 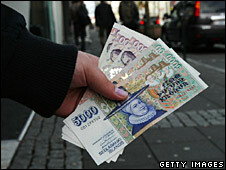 For example, at the end of October, Iceland threatened to resume talks with Russian over a possible loan. It had only reached a "tentative" agreement on a $2bn loan with the IMF and said it still needed an additional $4bn. Shortly after, Poland's finance ministry said that the IMF and a group of European countries were ready to give Iceland the money it needed. Warsaw said that "the International Monetary Fund, Scandinavian countries, Britain, the Netherlands and Poland are likely to take part in the consortium" to offer a $6bn loan to Iceland. "It was always clear there would be considerable opposition to Russia getting involved with something like this in a country like Iceland, and with the IMF now being there I'd be surprised if this was still on the cards," said Mr Danielsson at the LSE. However, only Poland, which said it would contribute $200m to the rescue fund, has confirmed the move. For now, at least, it looks like many of Iceland's old friends are again willing to help the country, several weeks after its banking system collapsed. Whatever provoked the change of heart, it's clear that many in Europe fear that Russian help comes with strings attached. "It is difficult [for Iceland] to be connected to Russia with this loan. All connections to Russia are political," says Jon Olafsson, a political analyst at Bifrost University.